The proposed legislation is due before the Dáil in the new year. There could be trouble ahead for government as a Cabinet split emerges over Occupied Territories Bill. INDEPENDENT ALLIANCE MEMBERS in government are pushing for a free vote on the Occupied Territories Bill which is due before the Dáil in the new year. 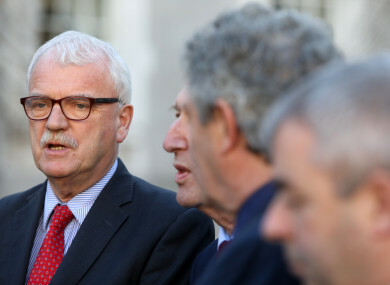 Minister of State for Disabilities Finian McGrath told TheJournal.ie that the Independent Alliance wants to support the Bill and wants a free vote on it. Members of the Independent Alliance voiced their concerns and outlined their position with Tánaiste Simon Coveney on Tuesday. A meeting with senior department officials was also held on Wednesday, with McGrath stating that “our strong views were made known”. The Bill, which was passed in the Seanad last week, aims to prohibit Ireland from trading in goods and services from Israeli-occupied territories by prohibiting “the import and sales of goods, services and natural resources originating in illegal settlements in occupied territories”. Despite government opposition, the Bill has cross-party support from Labour, Sinn Féin, Fianna Fáil as well as independent senators. McGrath, as well as his ministerial colleague, John Halligan have stated previously that the Bill will be a “major problem” between government ranks made up of Fine Gael and the Independent Alliance. The division within Cabinet between Fine Gael members and independent ministers could be heightened with speculation that Children’s Minister Katherine Zappone is also considering supporting the Bill. The issues have been well flagged with Fine Gael ministers, with the Independent Alliance stating that it has serious views on the issue of Palestine and Israel, with McGrath telling this publication during the summer that there could be a “major problem” when the Bill reaches the Dáil. “We will sit down over the summer period and discuss it. We have aspects of our foreign policy in the programme for government. I know from talking to Simon [Coveney] that that will be implemented,” he said in June. The Bill, which is expected to be brought before the Dáil under Fianna Fáil, was first proposed by Independent Senator Frances Black. However, it has the full backing of Niall Collins, Fianna Fáil’s Foreign Affairs spokesperson. It is expected to come before the House early in the new year, possibly February. Despite many legal experts stating the proposed legislation is compliant with EU law, Tánaiste Simon Coveney continues to rely on advice he said he has received from the current Attorney General, who says it would breach law. The advice has not been published, but it warns that Ireland could stand liable to class action. A number of legal experts such as Irish Senior Counsel Michael Lynn, Professor James Crawford, who is a judge of the International Court of Justice as well as Senator Michael McDowell, a former attorney general, all back the legislation. Most recently, Takis Tridimas, a professor of EU law at King’s College London, attested to the legality of the Bill. Email “Independent Alliance to seek a free vote for Israeli goods trade ban Bill”. Feedback on “Independent Alliance to seek a free vote for Israeli goods trade ban Bill”.